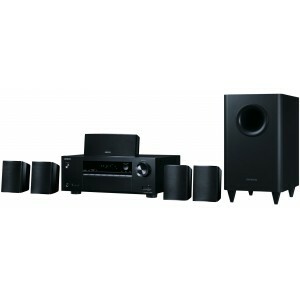 Onkyo HT-S3800 is a 5.1 Channel Home Cinema Receiver/Speaker Package offering big sound for your screen, above and beyond a basic soundbar or soundbase. Earn 288 loyalty points when you order this item. Onkyo HT-S3800 cinema package, made up of a corresponding AV receiver and 5.1 speaker set, is a compressed hub linking all your devices to the TV by a single HDMI cable. It enriches thrilling dynamics for film and game soundtracks with a condensed but dominant speaker system. As screens becoming flatter and broader, they are capable of offering pristine images but with the sound flattened inside, it is unable to match the picture quality. This package guarantees that you don’t lose out and instead acquire an immersive untinny auditory experience. The package supports 4K/60Hz, HDR, HDCP 2.2 on top of providing you with an FM/AM tuner and Bluetooth technology to stream virtually any audio for full-blown playback. On top of all this, 7 decades of experience in high-fidelity module development backs every product Onkyo make, converting daily entertainment into a larger-than-life event. The HT-R395 receiver is capable of decoding Dolby TrueHD and DTS-HD Master Audio which are the two most prevalent lossless Blu-ray layouts that make a soundtrack indistinguishable to the studio master, so you perceive it exactly as it was intended to be heard. Equipped with quad HDMI terminals supporting HDCP 2.2 reproduction security and High Dynamic Range (HDR) for 4K/60 Hz films on state-of-art TV sets, connections are ample enough to attach your consoles, BD Player and media streamer. Data from a DVD player and VCR are upscaled and delivered to presentation neatly via the same HDMI cable. Candid, discrete analogue amplifiers (instead of cheap IC chips) transport high prompt current to govern the speakers for authoritative and lively aural replay. This exact power is the foundation of Onkyo’s amplification attitude. HT-S3800 is packaged with a six piece superior surround-sound speaker system built especially for smaller movie, workstation or dorm rooms. Front L/R, centre, and two setting speakers encompass comprehensive drivers that catch a varied frequency gamut, giving you the entire audio depiction, while the slim subwoofer supplies a fulfilling oomph to every eruption and bass-drum kick. Stream effectively any audio from your attuned smartphone, tablet, or PC to your home theatre. Simply press a button on the front panel, couple your device, and begin reveling in room-filling sound. There’s also a USB for wired reproduction of MP3s from flash drives. Links to speakers and peripheral devices are exemplified and clearly categorised on the back plate. Onkyo has even added color-coded speaker wires meaning you can get your setup underway instantly.